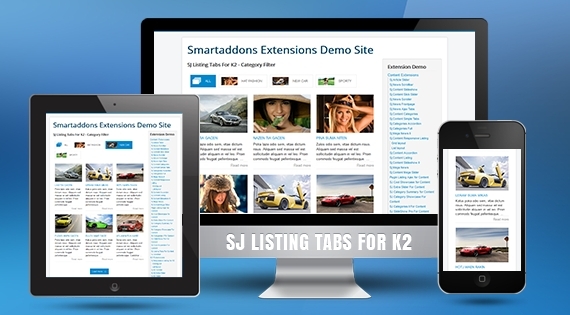 SJ Listing Tabs for K2 is a stunning Joomla listing tabs extension for K2 component to show your products lively and conveniently. The module displays products according to categories or article fields. It means that you can arrange your categories as tabs or set article's attributes as tabs. SJ Listing Tabs for K2 allows you to set the number of column displaying for each device screen resolution. You are also free to choose which categories/item's fields to show. Besides, it supports to display icons for category tabs which are retrieved from various sources and you can resize them as your wishes. SJ Listing Tabs for K2 comes with a friendly user interface that allows you totally control, customize all parameters of the module. With 10+ cool effects equipped, the module can be placed on everywhere on your website, in whatever size to effectively highlight your content.